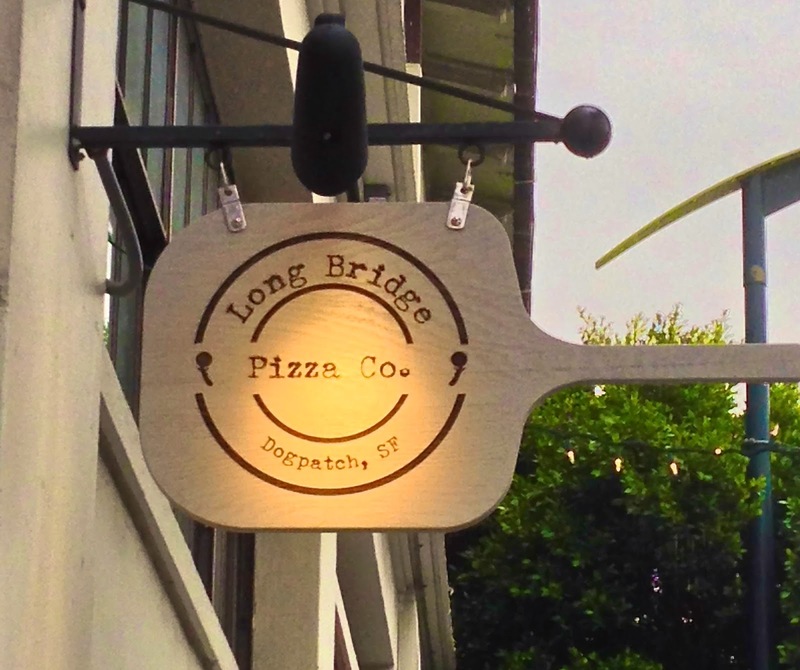 Places I've Eaten: LONG BRIDGE PIZZA DOGPATCH...OVER THE RIVER AND DOWN 3RD STREET WE GO! It's a small space along 3rd Street, which seems to be a new hotbed of food places these days. Though if it weren't for the smell of cooking pizza emanating from the place you might walk right by it. It's named after the original name of a bridge that ran down what is now 3rd street. You can read all about it and Dogpatch here. It's run by two guys who worked at places like Pizzahacker, A16 and Tony's Pizza Napoletana--so they should know what they are doing. Their menu consists of 8 pies you can get in either an 12 or 18 inch version. No creating your own here, which seems to be the new thing at pizza places that have opened up in the last few years. Fortunately the choices they have sound tasty. On my first visit it's pretty empty so I figure I'll eat in by myself and get just a 12 inch. Here you place your order at the counter and then find a space to sit. I get the sausage which also comes with roasted red peppers, red onion, regular and smoke mozzarella, parmesan and an herby tomato sauce. Everything is cooked to order so it comes out piping hot. This is thin crust pizza and fortunately for them (or me) it doesn't suffer too much from soggy tip syndrome. There's a little bit, but the crust is baked perfectly and crisply and the wet sauce doesn't create a whole lot of sogginess that can weigh a pie down. The toppings are generous without being overwhelming. A spicy Italian sausage that pairs well with the sweetness of the peppers and onions. I liked they didn't over sauce either and it has just the right amount of herbs to balance out all the flavors. The other surprise was the bottom wasn't burnt--a problem I sometimes run into with thin, wood fired pizzas. Here there were just a few hints of char here and there, enough to give it some smokiness, but not too much that it tasted burnt. Also, for a big eater like me, the 12 inch was more than filling enough, and yes I ate the whole thing by myself in one sitting. Thus the un-joys of no leftovers. Cost on this was $14.71, which is in the area of "artisan" pizzas is decent, if maybe a buck or so higher. Nonetheless, I still enjoyed what I had. But I wasn't totally done. On a different occasion I decided to try one to go to see if it still held up. They don't have delivery so I phoned in an order and went in to pick it up. This time I was sharing with a co-worker and we went full on 18 inch White Pie which has spinach, ricotta, garlic, mozzarella and olive oil drizzle. It was really huge, though at just over $25 was, again, a buck or so more than I might have like. Still, like the above pie, I liked this one too. I'm a fan of "white pizzas", sometimes I'm just not in a tomato sauce mood and this cheesy version is a great alternative. The thin crust was appropriately crispy and the tips held up well again. There were healthy doses of spinach and cheese and just enough garlic to make it flavorful. Plus, you know there is all that spinach so you can delude yourself into thinking you are eating "healthy". In the case of pizza--whatever works for ya'! The olive oil also gives it a pleasant earthy, green note. All around a winner for me and my co-worker. And yet again, it was all eaten, no leftovers to report on. As a space added to the pantheon of pizza places in San Francisco, Long Bridge is serving up decent, tasty pies with nice flavor combinations. Does it make my top 5 list, not quite, but they are definitely close. It is also a great addition to Dogpatch, particularly with the two breweries (and a forthcoming two) and wine bars in the area making it a convenient and worthwhile pizza stop if you live or work area.